Olivia D'Ambrosio and Deb Martin in Gidion's Knot. Photo: Marc J. Franklin. Close followers of the local scene know that Bridge Rep, in just over a year, has established itself as an artistic leader on the fringe - indeed, you could argue they reliably meet (or beat) the acting standards of all our mid-sized companies. And their latest, Johnna Adams' Gidion's Knot, as directed by local acting light Karen MacDonald, will only burnish that reputation; indeed you could argue it's their most exquisitely acted production yet. The case against the company, though, is that it tends to choose actor catnip over more deeply realized texts (unfortunately I missed their version of Pinter's The Lover). And I think the promise, but ultimate frustrations, of Gidion's Knot will only burnish that reputation, too. Not that the troupe shies away from controversy: in fact Gidion's Knot relentlessly pushes audience buttons by tagging hot topics like elementary school violence, bullying, and pre-pubescent sexual identity. Yet somehow the playwright can't quite sound the full depth of these themes; she gives her two actresses an emotional workout, that's for sure - but she leaves us wondering what, in the end, is her point (if she's got one). The set-up is spare - a parent-teacher conference in an empty classroom. But the stakes are high: the two participants are both stricken, and from the first moments tragedy seems about to bead out of the air like a shower of tears. We gather that a sixth-grade student (the eponymous Gidion) has been suspended for penning a menacing poem - and then, shockingly, the boy committed suicide. His mother is groping for clues as to motive; his teacher is hoping to avoid judgment - or even inquiry. Both are still in the throes of extreme grief. And both Bridge Rep actresses are superb in their commitment to these challenging roles. Olivia D'Ambrosio makes Heather, the earnest teacher, sensitive yet defensive - and perhaps in the end utterly and unlikably conventional. Meanwhile Deb Martin dares to make Corryn, the mournful mother, a prickly loner whose edgy sense of personal aesthetics (she's a local professor of ancient literature) probably has done her son no favors when it came to fitting in at school. 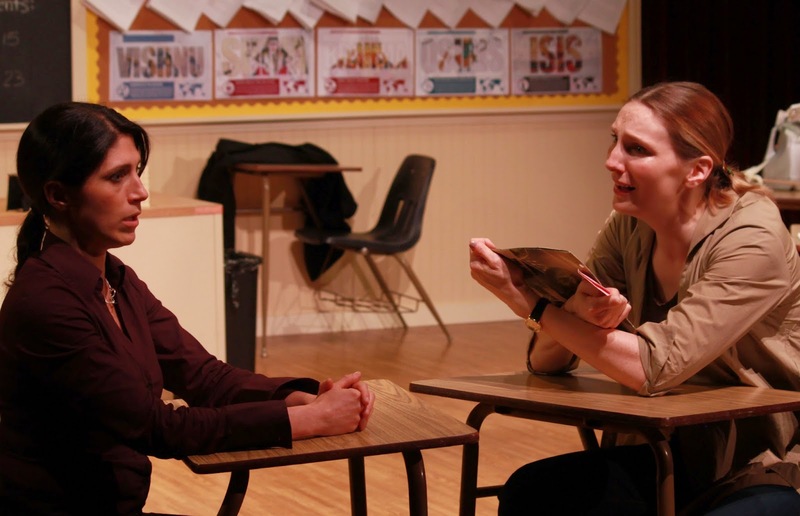 It seems that playwright Adams has it in mind to deploy this duo as both mirror and lens in an exploration of our conflicted attitudes toward childhood development, socialization and safety. And at first she seems to have the guts to match her artistic ambitions. The provocative poem she conjures from the dead Gidion's pen is blood-curdling (if not stomach-churning) - yet somehow compelling; and Adams deftly leaves a trail of clues among his classroom effects (avidly gathered and analyzed by his mother) as to precisely what torments drove him to his troubling cri de coeur. I have to admit, though, that the play is sometimes marred by rather bald symbolism ("Gidion" is a bit much, particularly when a classmate is named "Seneca"), as well as a good deal of treading of dramatic water (Corryn's first entrance seems to take fifteen minutes). All the padding is all the more frustrating because in the end, Adams only goes so far, and lets both her leading ladies off the hook to some degree. She never forces Heather to acknowledge the blind eye she has eagerly turned to the abusive situation simmering in her classroom; and she never makes Corryn admit that in the schoolyard of today, the vengeful violence of Beowulf has no place - and moreover, that she has been utterly ignoring her son's building trauma (indeed, perhaps she has even been fetishizing the pain that drives artistic expression rather than relieving it). Needless to say, if Adams had dared to go the distance that her themes imply, she would have had more than enough material to fill out two full hours of stage time. But instead, the playwright cops out with a final "twist" that leads her antagonists onto some kind of slightly-phony common ground. Oh well; another missed chance on the playwriting scene! It's too bad, because these two actresses are so emotionally committed, and MacDonald has done a scrupulously detailed job - and even the scenic design (by Esme Allen) is creative. I wish I could say that Adams has broken out of the development pack and penned a text that's worthy of her interpreters. Maybe someday she will; but I'm afraid for the time being, once more the song on the new play scene remains the same.